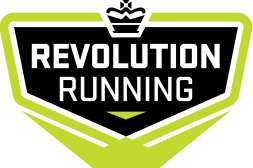 "Revolution Running" was voted for by BoldRunning club members from a short list of possible new names in November 2012. We believe this is an apt name as "Revolution" brings about images of change, new beginnings and a shift in culture from the old ways, which is very true in this case. It is also a great way to describe the personal, physical and mental changes that take place during the course of training with this club and is reflective of the philosophy of the club to do it differently than other groups and clubs in the area. The new logo, graphics and imagery have been put together to showcase a new direction and to play a little on the theme of revolution. We also wanted these graphics to be somewhat representative of Training Club Director, Ewen North's British heritage and background. We hope you like the new name and brand and will join us in continuing to be the most welcoming, fun, social and progressive club around.